In our recently released strategy note (The Gilt sell-off, mounting UK economic risks and an inflation scare that rhymes) we outlined that the upsurge in UK break-even inflation rates to over 3% had over-stated the likely path of UK inflation. Admittedly, the slump in the GBP will drive import prices higher and could see the Bank of England’s (BOE) 2% inflation target overshot by over 1% within 12-18 months. However, the laggardly nature of wage growth and growing downside risks to the economy will mean this poses more of a threat to household disposable incomes and hence private consumption more than it will spark a second round inflation effect. A steep disinflation if not deflation will follow the import price shock. 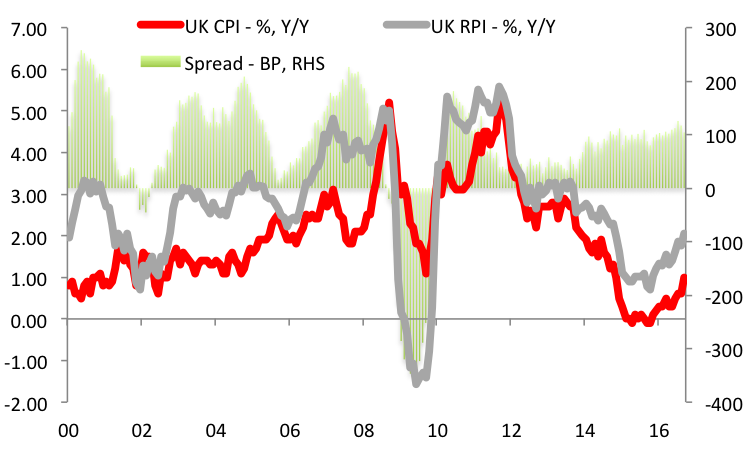 One rejoinder to the view that BE spreads have overshot is that the reference rate for UK Linkers is the RPI rather than the CPI. Due to numerous computational and compositional weaknesses, the RPI substantially overstates the level of inflation as determined by the more robust CPI. This “inflation wedge” currently sees the RPI 104bp above the 1.0% Y/Y rise in the CPI and over the past 5 years has averaged 71bp, which has been the medium-term differential. BOE analysis suggests that the wedge could rise to 1.4pp over the long-term. This questions whether UK BE inflation rates have actually overshot since a 3% RPI may be consistent with a CPI of 2% or lower. This is a viable criticism. However, there is a strong cyclical component to the UK inflation wedge. One of the reasons why the RPI tends to be higher than the CPI is that it includes measures of housing price trends and mortgage payments. Both of these measures tend to move lower into a UK economic downturn. Chart 1 demonstrated how the CPI wedge turned steeply negative in 2008-2009 when the UK economy went into a deep recession, and then reasserted a positive differential as the recovery matured. Given our growing concerns with respect to the UK economic outlook, we would expect the cyclicality of the inflation wedge to narrow the differential between the CPi and the RPI. Hence, we feel confident in believing that UK BE spreads have over-short the likely path of inflation. The Bank of Japan delivered a new monetary regime following today’s policy meeting. Unfortunately, the switch to a yield and yield curve targeting framework will lessen the authorities’ ability to achieve their growth and inflation targets. 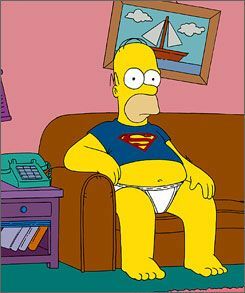 The new regime is internally inconsistent, lacks a theoretical anchor and may compel an early tapering of QE. The new policy regime may provide a support to investors looking to buy-JGBs and receive JPY IRS in the 10-yr area of the curve as the BOJ tries to limit sell-offs and create a path to stable roll and carry returns. (The “old faithful” JPY IRS 7fwd 3yr is a “receive” into today’s policy decision.) However, in so doing the BOJ will slow the flow of liquidity into risk assets by allowing Japanese financial institutions to maintain their deflation-focussed portfolio mix. The new regime will also make it more difficult for the BOJ to prevent continued downside moves in USD/JPY over the coming months. One of our core medium-term investment themes has been for the emergence of a cyclically and secularly weak CNY, and we continue to hold to this view. The Chinese authorities’ current embrace of a weak-CNY is expected to persist, with the pace of CNY depreciation continuing to out-strip that priced into the FX forward curve. We also continue to favour positioning for CNY weakness via the NDF curve rather than the CNH offshore forward market, and accept paying wider forward points in return for reduced fixing risk. The method that the authorities have deployed to weaken the CNY has allowed the sizable depreciation seen over the past few quarters to go somewhat below the market’s radar screen. Nonetheless, continued CNY weakness may increasingly influence the performance of currencies and markets in Asia ex-Japan. The current liquidity driven rally in emerging markets may therefore provide attractive opportunities to short Asian currencies such as KRW and SGD, and also initiate some interest rate trades such as recieving KRW IRS and implementing SGD IRS curve flatteners. 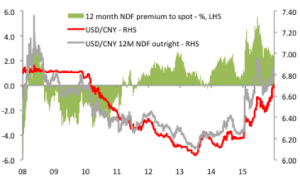 An additional appeal of a long-USD/CNY position is that the position contains an embedded long convexity component. There are growing non-linear economic risks associated with China’s economic slowdown given the combination of surplus industrial capacity, an increasingly inefficient allocation of capital and exceptionally high corporate leverage. These risk will increasingly require ultra-accomodative monetary settings to help limit the rise of credit risk and NPLs, and such a policy is consistent with a faster pace of CNY weakness. The unprecedented recent stability of the CNY IRS curve reflects the current policy stasis: PBoC is trying to strike a balance between supporting economic growth with low rates and limiting the rise in USD-demand; ultimately, as growth continues to slow the need for lower interest rates will prevail and the CNY IRS 2s5s spread is likely to steepen sharply as the fixing rate is allowed to decline. To receive the full note please contact http://admin@eventhorizon-research.com or access the full note via http://rsrchxchange.com.